Reviewed from an electronic galley sent by the publisher. It's no secret, Louise and I are fans of Loree Griffin Burns. In 2010 we coordinated a Mock Newbery program for readers in grades 3-6, and we included The Hive Detectives on the reading list. 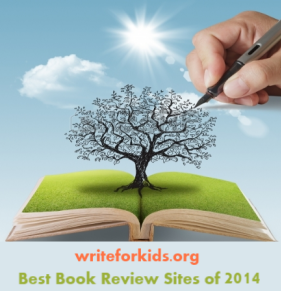 We reviewed Citizen Scientists and named it one of the top ten math and science books of 2012. I was excited when I learned a new book by Burns would be released in 2014. 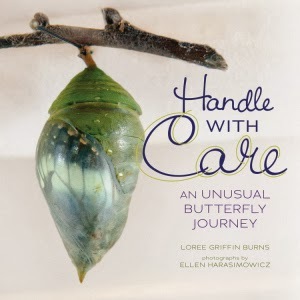 In Handle with Care, Burns turns her attention to butterflies, but this is not your typical informational book about butterflies. The story begins at the Boston Museum of Science where a package has arrived. Inside the box is Blue Morpho butterfly pupa. The pupa traveled to Boston from a butterfly farm in Costa Rica. In a clear, accessible narrative accompanied by up-close, colorful photographs, readers learn how farmers care for caterpillars and butterflies at the El Bosque Nuevo farm. The farm raises butterflies for museums where visitors can see them in live exhibits. Handle with Care is a teacher's dream. It's the kind of book that kids will be eager to pick up on their own for pleasure reading, and it would be an excellent book to use in science classes. Students in elementary school will be able to read it independently and understand the concepts presented. Back matter includes a glossary, bibliography, index and information about visiting a live butterfly exhibit. Several years ago I visited the butterfly garden at the Boston Museum of Science. I was in awe of the gorgeous butterflies, but I never thought about how they got to the museum. Now I know! 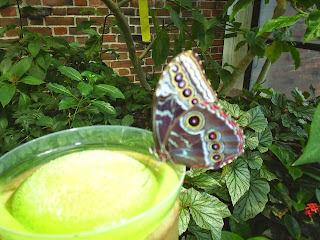 Photo taken by Cathy at the Butterfly Garden at the Boston Museum of Science.